Thinking about building that machine shop / mechanic game? Look no further with the Mechanic's Tool-set Asset Pack. 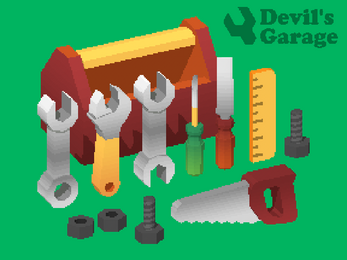 The Devil's Work.shop Pixel Art asset pack contains a whole bunch of tools. These assets have been drawn in 8 directions and some of them even have different angles. The assets are organized, named logically, trimmed to the smallest size. The asset pack also contains a texture atlas of all the assets. If you like this Game Asset Pack, please consider taking a moment to rate/review it. Your continued support helps The Devil's Work.shop bring new improvements to the pack. Cheers! Looking for the 3D asset?